The Colonia Tabacalera, near the centro histórico, has been down at the heels for a long time. This is a situation that might change, sooner or later. 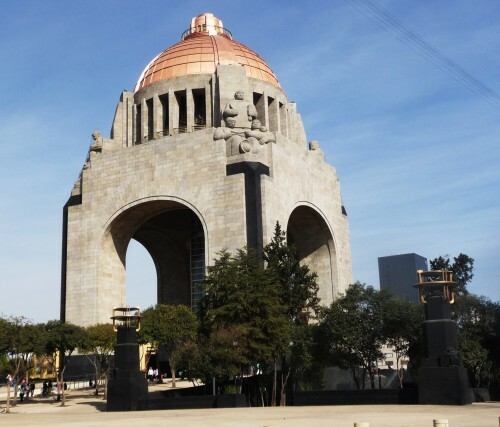 In 2010, for the bicentennial of Mexico's revolution, Mayor Marcelo Ebrard renovated the neighborhood's centerpiece, the Monumento a la Revolución and its surrounding plaza. The monument is a crypt for some of Mexico's revolutionary heroes, whose exploits are outlined in a museum in the building's basement. You can take an elevator and stairs to the top and get a view of the surrounding area. Or just stroll around -- on weekends families make the plaza their playground, and once in a while there is a free concert in the open air. Still, the rest of the neighborhood has some catching up to do. The Frontón México, where jai alai had been played since the 1930s, has been closed since 1992. I sometimes fantasize about buying a building here and renting the apartments to my friends, which in practical terms is probably a recipe for disaster. The neighborhood is home to many short-time hotels with a deliciously seedy appearance. Still, I noticed that since the plaza was spruced up, some of these places, like the Royalty here, sprang for a new coat of paint on their facades. Will any of them reemerge as the next hip boutique hotel? While we are waiting for Philippe Starck, my friend Fabiola opened the Hostel Suites D.F. on calle Jesus Terán #38, a cute place with about 18 rooms, including dorms, family rooms and private rooms. Like most hostels, it's basic, but a cheerful place, and it's hard to beat the prices -- between 180 and 500 pesos, internet and breakfast included.